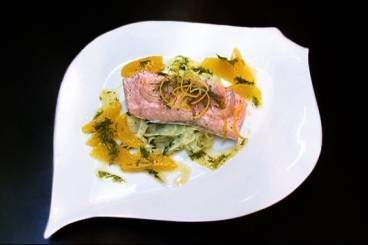 Salmon fillet steam cooked 'en papillote' served with a fennel and orange salad and a dill vinaigrette. Peel and finely slice the shallot. Zest and juice the lemon. Season the salmon with salt and pepper and rub with the olive oil. Sprinkle the lemon zest over the salmon and then place slices of shallot and a sprig of dill on top of each fillet. Place in the silicone papillotte moulds and pour the wine into the base. Transfer to the oven and bake for 10-12 minutes. Zest the oranges and then set the zest aside to use in the vinaigrette. Segment the oranges. Reserve the juice. Cut the fennel bulb in half and remove the tough core. Finely slice the fennel on the mandolin. Season with salt and pepper and a drizzle of olive oil. Pick the leaves from the parsley and roughly chop the leaves. Mix this with the fennel. Pick the leaves from the dill and roughly chop. Mix the olive oil, sherry vinegar, orange zest and juice together in a bowl. Add the dill and season with salt. Remove the salmon from the oven and sprinkle on some lemon juice. Arrange the fennel in the middle of the plate and surround with the orange segments. Finish with a drizzle of the dill vinaigrette.